IMHX will see the first outing for AutoStore in the UK. Swisslog will also showcase SmartCarrier and its project management skills at the exhibition. 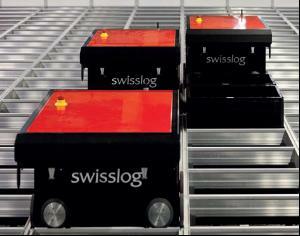 Automated materials handling experts, Swisslog, are set to present a masterclass in complex project management and full service solutions when they exhibit at IMHX. The NEC exhibition will be AutoStore's first public outing in the UK. A highly flexible, space-saving concept for storing and picking single items and small parts, AutoStore's capabilities has already excited major retailers, with the likes of Ocado and Asda signing up to the first UK installations. Swisslog's IMHX stand will give visitors the opportunity to see the modular system in action thanks to a specially commissioned pick station that will deliver visitors a complimentary beverage. Reflecting its ability to provide materials handling solutions for every requirement, visitors will also be able to view the popular SmartCarrier storage and transport solution for totes and trays, live on the Swisslog booth. "At Swisslog we have a fairly straightforward approach to what can be seen as a complex issue," explains James Sharples, head of sales & consultancy. "We eliminate risk and inefficiencies for customers when delivering new or adapted automated warehouse solutions, but it takes the type of face-to-face opportunities that shows like IMHX offers, to really demonstrate this in more definitive terms." Swisslog is rightly proud of its successes to date, particularly in the food and beverage, retail and pharmaceutical industries. But it not only has an excellent range of solutions for materials handling requirements, it also has considerable expertise in the planning and implementation of entire distribution centres including architecture and construction aspects, all aimed at ensuring the complete facility is perfectly aligned and optimally utilised. James believes the exhibition provides the perfect platform for showcasing Swisslog's state-of-the-art products, while enhancing brand awareness with both existing and potential customers. "These are ideal surroundings for us to demonstrate to our users exactly how we develop our products and services. We work under the motto 'Design, Deliver, Develop' and believe events like these are essential for us to get a real understanding of the qualities our customers want in their logistics systems. The overall goal is the continued success of both their business and ours." Ocado boosts space with AutoStore A good example of Swisslog's forward thinking approach is its work with Ocado. Swisslog's AutoStore system will provide Ocado's new Non Food DC in Welwyn Garden City, Hertfordshire with automated storage, handling and picking of non-food items. The success of the independent online retailer has led to increased business for non-food items and household goods, making the desire to maximise the efficiencies of storage and picking operations. Ocado needed a practical and efficient automated solution that would complement its existing systems and optimise usage of available space. AutoStore is installed at a new site close to the existing 23-acre Hatfield site and will be integrated with Ocado's existing fulfilment operation. Swisslog's AutoStore solution will comprise of 31 robots, four ergonomic pick stations and two decant stations which will provide a highly efficient warehouse solution with better space optimisation, high throughput and allow all pickers access to every SKU at each pick station. With its modular design, Swisslog's AutoStore is easily extended as the business grows. Ocado's James Matthews, director of non food, says: "We are very excited about the opportunities presented by Swisslog's AutoStore. An operation of this size presents many complex requirements. From the outset we were looking to work with a supplier that had the skills and resources to effectively design and manage the whole process to present a solution that would facilitate further expansion. Swisslog and AutoStore ticked all the boxes." AutoStore offers a range of benefits, including the efficient warehousing and order processing of single items and small cases in a very compact area. The system provides the highest possible rate of space optimisation teamed with extremely dense storage, as robots on the top of the grid automatically store and retrieve goods with minimum space requirements. Compared to traditional automated solutions, AutoStore allows far greater capacity and storage density, with up to 60% more goods stored in the same space as a conventional materials handling solution. The project represents a major investment for Ocado and a long term commitment by Swisslog who will provide maintenance and support through its team of dedicated service engineers.